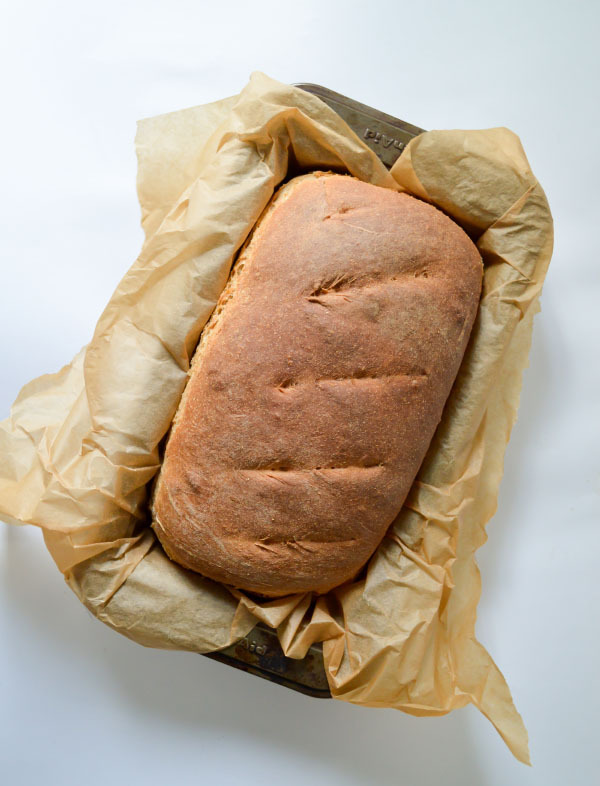 A few readers have asked for my recipe for homemade whole wheat sourdough bread, so here it is! I adapted this recipe from one of the recipes on King Arthur Flour’s website (I can’t remember which one) and have tweaked it as I go to yield a delicious loaf of sandwich bread. 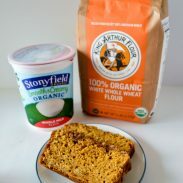 I’ve tested this current version over and over again, and it consistently yields a well-risen, fluffy yet sturdy, and flavorful loaf – with minimal hands-on time required. 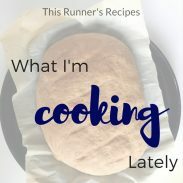 A good loaf of homemade bread is both an art and a science, much like the art and science of running a marathon. It takes patience and trial and error, but the reward is well worth the effort. The beauty of sourdough bread is my sourdough bread, made here in a suburb of Seattle, will taste different than your sourdough bread made in Chicago, New York, or anywhere else. The local microbes in the air interact with the water and flour as they ferment, rendering a slightly different taste in each area. You can purchase a sourdough starter, receive some from a friend, or make your own. Making your own starter sounds intimidating – it was for me – but the process is actually surprising simple. 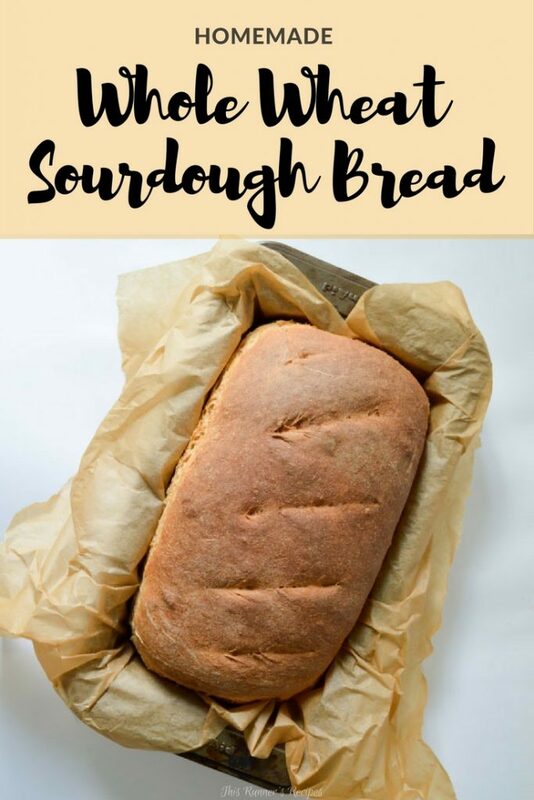 I used this sourdough starter recipe and guide from King Arthur Flour. Once you have a starter, you simply have to feed it once per week in order to maintain it. If you are baking once or twice per week with it, store it in the fridge. I store mine in the fridge and then feed it a tiny bit (usually 1-2 ounces each of water and flour) the day before I want to bake. You don’t have to do this step, but I find that it perks up the starter a bit of a great rise and tangy flavor. That sounds time-consuming and tiresome, but in reality you spend very little hands-on time with the bread, especially if you have a stand mixer and kitchen scale. Proofing the yeast isn’t necessary in all sourdough bread recipes – the wild yeast will usually suffice for leavening – but I find that the addition of a tiny amount of yeast makes sourdough bread baking less intimidating and yields a tall, fluffy loaf of sandwich bread. The autolyse is an indispensable step for homemade bread – but thankfully, all this step really includes you doing is nothing. That’s right, nothing – no kneading, no mixing, nothing. In this step, you let the lightly mixed dough sit for 20 minutes so the enzymes can break down. 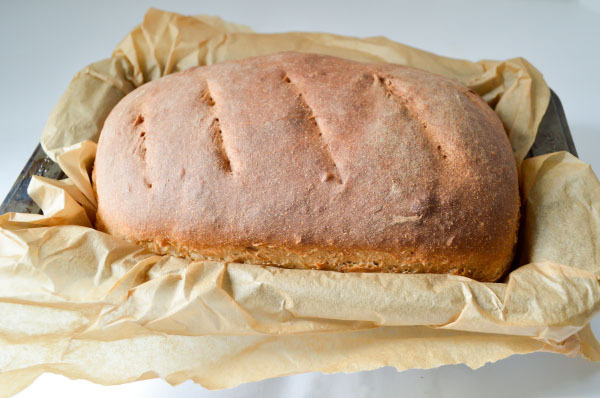 If you are using whole wheat flour, this step helps in having fluffy bread rather than dense bread. Kneading is made magically easier by a stand mixer, but if you don’t have one, you can use this as an opportunity to work on some upper body strength. For rising, I create a humid, warm environment using my oven and a pot of boiling water. As the dough kneads, I preheat my oven to the lowest temperature setting and bring a pot of water to a boil. Once the dough is ready, I turn off the oven, place the pot of boiling water on the lower shelf, and place the dough in the mixing bowl on the top shelf. This will keep the oven warm and humid through both rises. Now, if you complete the final rise step and the bread hasn’t risen, don’t discard the dough – make pizza with it! Inevitably, some loaves won’t rise well, but this bread will also make a tasty pizza dough, even if it didn’t rise well. 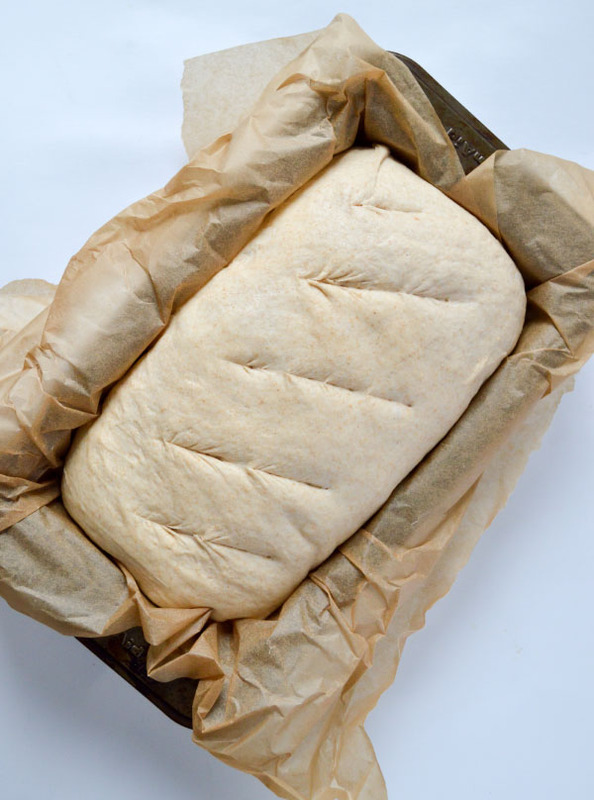 One loaf equals two pizza doughs – use one now and freeze the other for later. Finally, baking! To achieve a golden brown and chewy crust, I transfer the water from the pot to an oven-safe pan and place it on the bottom shelf. A final note: chlorine in tap water can hinder rise. I simply boil tap water for 5 minutes to dissipate some of the chlorine, then let it cool completely. If you live in an area with poor tasting water, you may want to use bottled water or filtered in making your bread. Sprinkle the yeast onto the lukewarm water. Add the maple syrup and stir gently to combine. Let proof for 5-10 minutes, until some foam appears on top. In a large mixing bowl, combine the water-yeast mixture, the starter, the flours, and the salt. Use a wooden spoon or large spatula to combine into a shaggy dough. Use the dough hook attachment of your stand mixer or your hands to knead the dough until smooth, slightly sticky, and springy, about 5-7 minutes. As you knead the dough, heat the oven to the lowest temperature and boil a pot of water. Once the dough has been kneaded, lightly grease the mixing bowl with a small amount of olive oil and place the dough in it. Cover the bowl with a towel. Turn off the oven, place the pot of water on the bottom shelf, and place the mixing bowl on the top shelf. Let rise for 45 minutes or until almost doubled in size. Remove the dough from the oven and sprinkle with a small amount of flour. Knead a few times in the mixing bowl. The dough should be smooth and springy, but not too sticky at this point. 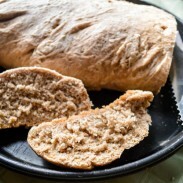 Shape into a loaf and place in a parchment paper lined bread loaf pan (8.5 x 4.5 inches). Return to the oven and let rise for another hour, or until the dough is rising above the top of the pan. Remove the dough and pot of water from the oven. Preheat the oven to 425 degrees Fahrenheit. Transfer the water to an oven-safe pan and place on the bottom rack of the stove. Use a sharp knife to make cuts along the top of the loaf. Bake for 35 minutes, or until golden brown and firm. Let cool for at least 30 minutes before cutting. *If your starter hasn’t yielded enough for 2 cups plus 4 ounces to reserve and feed, you can adjust the flour and water amounts. So if you only have 12 ounces of starter, you can add an additional 2 ounces of flour and 2 ounces of water to the dough. If you have only 1 cup of starter, proof an additional ½ teaspoon of yeast as well. What’s your favorite type of bread? There are very few things, if any, better than a slice of warm homemade bread hosting a slab of quickly melting salted butter. HEAVEN. It’s the best. Add a bit of honey? PERFECTION. Do they make scented candles of the smell?? please force me to make this bread already!